I cannot tell you how chuffed I am. I will admit I even did a little dance the other day. Why you might ask? Well, my new book, “Strategy Mapping for Learning organizations” is due out in December 2011, and I am delighted, honoured and humbled that David Norton himself, has written a Foreword for the book. Yes David P Norton of Norton and Kaplan fame, who together co-authored the original “Balanced Scorecard” book, and four other books since: “The Strategy Focused Organization”, “Strategy Maps”, “Alignment” and most recently “The Execution Premium”. To have David Norton write a foreword for my book is in itself is a great honour. You can imagine how quickly I got onto my publishers to ensure that “Foreword by David P Norton” was included on the front cover. However, I want to tell you what really made me chuffed. Of course David picks up on the fact that I am talking about Balanced scorecards and strategy maps from a perspective of behaviours: how people think about strategy and performance. Particularly, that the book explores how executives think about their strategy, their approach to performance management and the role of their Strategic Balanced Scorecard. David Norton refers to the book’s emphasis on both the left and right brain activities involved. Not simply the processes and techniques that “the engineers amongst us” so love (David’s background is engineering). “Our experience, however, indicates that effective leaders need more than a toolkit. Successful leaders are intuitive; they have a sense of what needs to be done. Successful leaders are communicators; they need to simplify and target complex messages. He makes an interesting point that I had not explicitly mentioned in the book, thought all the clues are there. “Jointly building a strategy map (a “left brain” approach) helps create the teamwork. An executive senses a need to break down traditional siloes (a “right brain” need). Cascading the strategy map (a “left brain” solution) helps to cut across siloes and create a holistic view of the organization. He continues to a point that for me gets to the heart of why so many balanced scorecards become operational collections of measures. And why so many people miss the important subtleties and principles that he and Bob Kaplan talk about in their books. The underlying difference. “We tend to think of a performance management system as a collection of structured methodologies and tools. By its very nature, it is easier to describe that which is structured than that which is unstructured. I will admit I was stunned by that. 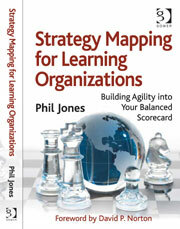 I had to read that again, “Phil Jones makes a unique contribution to the field of performance management.” Wow! I firmly believe that the whole behavioural side of strategy and performance management is not given enough emphasis. It is all too process and toolkit based. Much of my work over the last 15 years has been focused on the behavioural aspects. many regular readers will know I frequently say, “It is not about measures, it is about behaviours Stupid!” So to have David Norton endorse my “Strategy Mapping for Learning Organizations” in such a way was truly humbling. (And I did indeed do a little jig at this point). “This book is a “drivers manual” for anyone who is implementing a Balanced Scorecard performance management system. Well! David Norton finishing off with “Strategy Mapping for Learning organizations” is required reading, put the icing on the cake. So I am very grateful to David for his kind words and taking the time from his busy schedule to do a foreword for me. And also very honoured. I am delighted that David picked up on the left and right brain aspects of the balanced scorecard, strategy maps and the whole approach in the book. This sort of thinking underpins the Fourth Generation Balanced Scorecard approach I have developed. I hope you don’t mind me sharing my small moment of glory with you. If you would like to read the Foreword in full, or even buy the book, you can find out more about Strategy Mapping for Learning Organizations, on the book’s page of my website. A rather chuffed Phil Jones.